With Both Communities Concerned, Latino Muslims Learn About Their Rights President Trump's executive orders on immigration and border security have Latinos and Muslims concerned. In Los Angeles, Latino Muslims are educating themselves about their rights and going public. 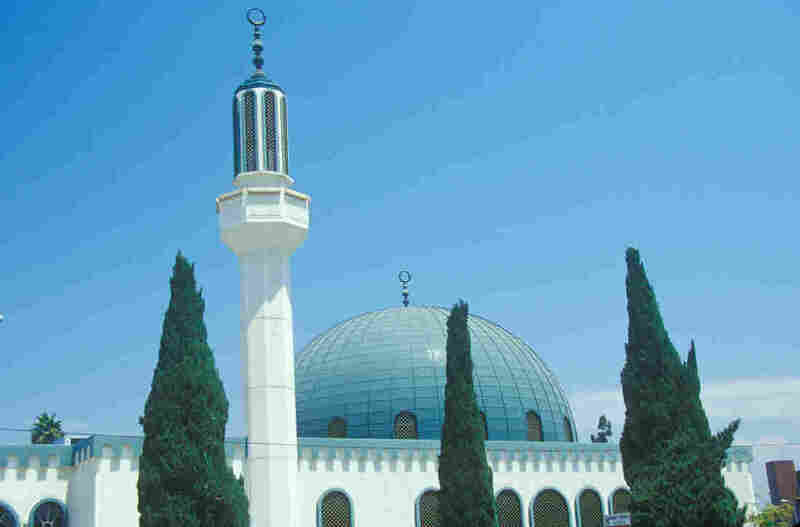 Masjid Omar ibn Al-Khattab Mosque in Los Angeles, Calif. There are some places where the two communities involved in President Trump's executive order on refugees and immigrants, as well as the one securing the U.S.-Mexico border, overlap. On a Sunday morning, around 40 worshipers gather at the Masjid Omar ibn Al-Khattab mosque in downtown Los Angeles. Between Koranic lessons and an Arabic class, this group gets advice on how to respond if immigration officers knock on their door. Though this may not be surprising with the current political climate, what is surprising is the language of the lecture: Spanish. The group goes by the name La Asociación Latino Musulmana de América and supports a growing number of Hispanic converts to Islam in Southern California. This gathering reflects the merging of cultures in a part of the country where neighbors are often from different parts of the world. Like many Latinas, Guadalupe Fernandez grew up Catholic. Then around a decade ago, she moved from Mexico to the U.S. and met a guy in English class. "In the beginning, we were just friends because I was afraid of the fact that he was Muslim," she says, as translated from Spanish. But the pair began to date and Fernandez became more interested in her partner Hamada Abdallah's religion. Eventually, she converted. Imam César Dominguez says that narrative is more and more common, especially in Southern California. "In every mosque around here, there are Hispanics," he says in Spanish. While many Latino and Muslim immigrants are looking over their shoulder right now, Dominguez says his community is exploring how to assert itself. "I think it's a really great moment to forge alliances and to work together," he says in Spanish. In fact, President Trump's immigration policies have inspired a Latino-Muslim collaboration in Southern California. Community organizer Shakheel Sayed recently brought together six local groups that specialize in everything from Muslim rights to Latino labor issues. Sayed says the two communities are being singled out unfairly. "People being demonized and dehumanized, which leaves near permanent scars on their mental state," he says. That's already happened to Fernandez. She's Latina, Muslim and here on an expired visa. "The day Mr. Trump won, I couldn't sleep," she says in Spanish. Fernandez and Abdallah, her husband, are both in their 30s and run a salvage yard on the outskirts of Los Angeles. Fernandez has a visa pending with the federal government. If she gets it, Abdallah's status changes as well. They're trying to make their case to whoever will listen, including customers. "What do you feel now when you hear about news about the Muslim people?" Abdallah asks. After fixing customer John Harold's truck, Abdallah switches from business to politics. He wants to know what his client thinks about Trump's immigration policies. "It's not a ban — it's um — what he's trying to stop is a lot of people coming from Mexico," Harold says. The conversation ends on a friendly note, but Abdallah is clearly frustrated with the results. "The one help him? Muslim people," Abdallah says. "And the mechanic, the one help him to put the engine? Latino people. The two people, the one he doesn't like to keep here? The two people who help him." Abdallah says next time his customer might need a part for his truck, he and his wife might not be around. They're trying to sell the business in case one or both of them gets deported. Jesse Hardman is a freelance reporter. You can follow him @JesseAHardman.